The capital city of Hungary, Budapest is one of Europe’s most beautiful cities in Europe. Budapest has a vibe of being calm and yet very busy at the same time. The city is split into Buda & Pest by the lovely river of Danube, which is an attraction in itself. Between the two sections of the city, there are a few islands scattered along the river, but the main one to visit is the Margaret island. This island has fantastic parks and is a popular recreational area for tourists and locals alike. The Danubius Hotel has a branch on this island which also boasts a beautiful thermal spa. This island does not allow many vehicles and therefore is ideal to stay for families with kids. It has a lovely musical fountain in the middle of the park, which comes on during months of summer. 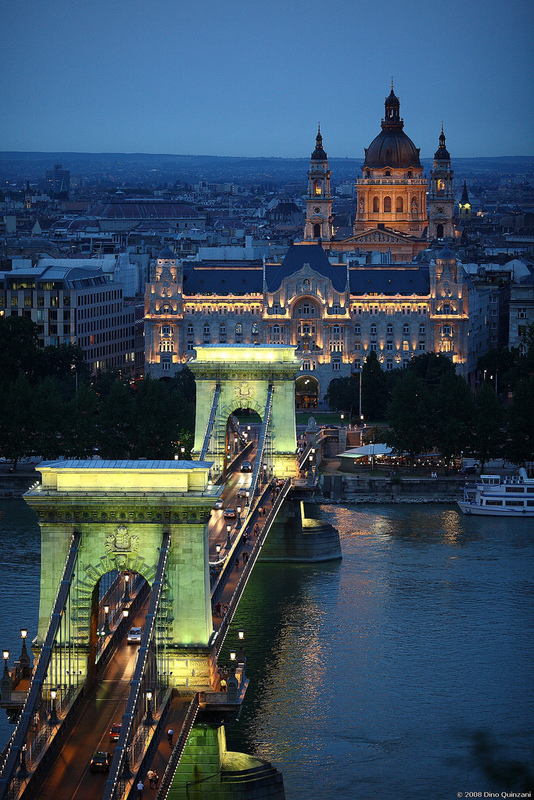 The two halves of the city are joined by many bridges, but the best one to remember is the chain bridge as seen in the picture below. Four Seasons Gresham Palace: This art nouveau landmark property has some of the best views in town, plus beautifully decorated rooms and everything you would expect from the Four Seasons brand. Undoubtedly one of the best Budapest hotels to stay in. Sofitel Budapest Chain Bridge Hotel: Another luxury big chain name, in a similarly excellent location. Elegant modern interiors and great facilities if you’re travelling for business rather than pleasure. Palazzo Zichy Hotel: This contemporary property sits in the shell of a fine 19th century mansion and boasts cool, clean interiors. Situated in the university district, there are plenty of interesting bars and clubs close by. Boutique Hotel Zara: Stylish modern hotel in the middle of the pedestrianised centre of town. Sleek black decor and minimalist style a stone’s throw from the Danube. Brody House: Reputedly the coolest hotel address in the city, come here to rub shoulders with creative types. It’s Budapest’s answer to Soho House.